Kenny is staying, let the party begin. 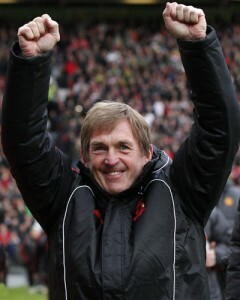 Kenny Dalglish is the new permanent manager of Liverpool Football Club. The caretaker manager since January, Kenny is now back in his old job and has a three year contract to go with it. To say Liverpool fans are happy about that is an understatement along the lines of describing Tom Hicks and George Gillett as not being very good for LFC. The news was revealed on the club’s official website just before Kenny’s regular weekly pre-match press-conference with those members of the media he sees each week. One of the worst-kept secrets since the club cut out the damaging off-record briefings we’d all grown tired of was that Kenny’s deal was agreed and would be announced at some point this weekend. Normally if there’s big news to be announced the club hold a press conference in front of the ‘big boys’ of the media but Kenny didn’t want that. He wanted to reward the lads he sees week in and week out at the normal press briefings to get this story and to ask the first questions. Even that says a lot about the man. Whereas some managers will ban reporters for asking the difficult questions, even if it’s from their club’s own TV station, Kenny is spoken about warmly by all the reporters who speak to him on a regular basis. The ‘big boys’ missed out this time and although not all of them were by any means hostile towards him the one or two who suggested he should stick to golf might be glad they weren’t asked to come up here anyway on this occasion. Continue reading Kenny is staying, let the party begin. Seven months on, now do they see? In the days following the departure of Rafael Benitez the speculation was mounting about who the club would be bringing in as a replacement. Already, after word had got out of his interest in the role, Kenny Dalglish was the fans’ favourite for the job – be it short-term until a change of owners or as a long-term role. At that time we’d not been given the full truth about how little time the owners had left to sell up or lose the club. It was quite clear that some of the fanciful ideas that had been put about by certain individuals agitating for a change of manager were nothing like the reality of the recruitment process that had now begun. Despite some laughable reports, the club didn’t have the means to approach coaches of the standard (and pay-scale) of Jose Mourinho, not that many supporters genuinely believed they did in any case. And those that did wondered how the club could persuade a top-drawer coach to manage LFC at a time when the Reds were making more from transfer fees than they were spending. A time when the club was falling apart. To supporters it seemed obvious what to do. But to the sections of the media that had campaigned for Rafa’s departure and were now campaigning for the appointment (and in later months the retention) of Roy Hodgson it wasn’t their idea so they mocked it at every opportunity. The club’s then executive management team said it didn’t fit in with their ideas, although they never really explained why. Now Kenny has the job, belatedly, and the smiles on the faces of supporters tell you why this was such a good idea. The positivity and unity sweeping through the club now is the strongest it has been in a very long time. If only the former board had listened to supporters last summer, instead of clamouring to the sections of the press that have nothing to do with Liverpool FC. Nothing to do with us other than criticising us, or complaining when they borrow (and break) our players for their England national side. Continue reading Seven months on, now do they see? A kip, then we take on the world. Kenny’s back. As Liverpool supporters around the world were celebrating the news that The King was coming back to manage their club, the man himself was flying back from the Middle East in readiness to take that job on. With Liverpool just four points above relegation it was clear to anyone with their eyes open that Roy Hodgson had failed in his task. The owners had been hoping that Hodgson would have it in him to keep the club ticking over until they found his permanent replacement, but as results continued to be a long way from good enough his comments were making it increasingly difficult to keep him in his post. They clearly needed a caretaker to step in and run the team until they had a permanent replacement available. There really wasn’t a better candidate than Kenny Dalglish and he was appointed from a distance, on his holiday, but there was only ever going to be one answer from the man who lives for this football club. As he landed at Manchester airport tonight he was mobbed by reporters and photographers, including the Sky Sports News cameras. Sky asked him if he had a message for the supporters: “Just it’s a great honour to be asked to come back,” he said, with cameras flashing away noisily enough to almost drown out his words. Continue reading A kip, then we take on the world. Kenny’s back. According to an exclusive report in today’s Sunday Telegraph, Liverpool FC look set to remove Roy Hodgson from his position as Liverpool manager before they have appointed a permanent replacement. 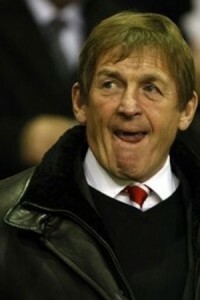 Kenny Dalglish may well get to take over until that appointment is made, probably in the summer. The future of Hodgson as Reds boss was never going to be decided on the back of one result or one set of comments, but the comments he made in the aftermath of the defeat against Wolves in midweek, along with the defeat itself, seem to have hastened a departure that had already been planned. On Friday it emerged that Fenway Sports Group (FSG, formerly NESV) had started to search in earnest for a successor to the former Fulham boss. The message was that Roy would be replaced as soon as a suitable candidate could be brought in and that although this could take until the end of the season it would definitely be happening as soon as possible. In the meantime, however, the suggestion was that FSG continued to have sufficient faith in him to manage the club until that replacement was found. Tonight’s report suggests they no longer have even that much faith in him and will install a temporary manager to look after the club for the rest of the season. Soon after FSG had taken over the club indications were made very quietly that they didn’t see Hodgson, already struggling, as a long-term incumbent. That said, they no doubt hoped that Roy could at least do what Martin Broughton had suggested he could the day he was unveiled as manager and “steady the ship”. They announced a search was underway for a new CEO; they publicly gave Roy their backing. A director of football strategy was appointed, but Roy continued to enjoy the support of the club’s hierarchy. Fans were going out of their way to send out the message that they’d no faith in Roy and weren’t even keen on him keeping the job short term, but the club did all they could to show their backing for him. This backing appeared to weaken when FSG’s two main men, the LFC chairman Tom Werner and principal owner John W Henry appeared on the club’s official TV channel. Speaking about the hugely disappointing result against Newcastle the owners described Liverpool’s results as “unacceptable”. There was disappointment to follow for supporters that same week. A meaningless Europa League match against Utrecht had been given some significance thanks to a gesture that saw free tickets being made available for children. Hodgson announced Torres would be playing and although an otherwise youthful line-up was expected the assumption was that the side would be sent out to entertain the young supporters making their first or rare visits to Anfield for a match. Torres didn’t appear, Hodgson suggesting the medical staff had told him late in the day that Torres should be rested. Not just that, the team came out to defend, entertainment was a word nobody used to describe the game. Bad weather meant Liverpool’s next two league games didn’t take place and so the next game was against Wolves, the match on Wednesday night that saw Hodgson question the support of Liverpool fans. Hodgson was forced to apologise. A win yesterday against Bolton saw Liverpool move into ninth place, still only six points above relegation with Hodgson suggesting afterwards that he’d have been happy with a draw. Now the Sunday Telegraph’s report says FSG “are so determined to end Roy Hodgson’s reign” that they are ready to install a caretaker manager until June, when they hope to install the permanent replacement. Dalglish has already made it clear he would jump at the chance of taking on the manager’s role if asked and the report says this news raises “the prospect of an emotional return to the club for Kenny Dalglish”. Dalglish had put himself forward for the role in the summer, and with the club’s management team at the time fully aware that there were just over three months left before the club had to change hands (even if it meant going into the hands of the bank) it is yet to be explained exactly why Dalglish’s offer was ignored, why Roy was given a three-year contract or why there was actually vacancy in the first place. The report also says FSG are believed to have looked at various candidates for the role, including Porto manager Andre Villas Boas and the previously-linked Didier Deschamps of Marseille. Installing the appropriate choice now, mid-season, is likely to be problematic and expensive, but it seems that FSG’s lack of confidence in the current manager means they want someone else to fill in for now and steady the ship in readiness for the permanent appointment. It goes without saying that The King would walk into the job with the unconditional support of the fans and also that he would be a unifying presence in the role, at a club where divide continues to cause harm.